The selling landscape has changed. Simply showing up and telling your customer about your company and it’s products and services just doesn’t cut it with today’s more demanding buyers. Sellers have to provide more value than product knowledge or pricing – things the customer can often learn on their own with a few clicks. In fact, recent research suggests that most customers don’t even engage a salesperson until they are 60% of the way through the buying process! To compete in the new world of selling, you need to be equipped with better skills – skills that don’t simply get acquired by adding years of experience. Making the same selling mistakes over and over again will not make you better. There ARE selling techniques and strategies which work better than others and the good news is that you can learn them if you’re committed to continued growth. Northbound’s methodologies work – period. They have been culled from hundreds of sources and have been proven to work in the real world. Our programs contain street tested ideas and actions that you can put into practice immediately. The formidable combination of workshops, coaching and tools will help you implement the ideas into your own sales process. Click here for a complete list of workshops for salespeople. Click here to learn about full sales team development programs. Contact us to arrange a complimentary no obligation workshop. Contact Michael at mcaron@northboundlearning.com or 416.456.1440 to get details. We are always happy to discuss your sales challenges. Northbound Sales has been providing cutting edge sales building programs to sales teams across North America for 10 years. Past and current clients include Maple Leaf Sports and Entertainment, Choice Hotels, Rogers Publishing and Aeroplan. Our typical clients are Vice-Presidents of Sales, Sales Directors and Sales Managers of mid-to-large sized companies with direct B2B sales forces. Our training programs have been developed, refined and proven. We have metrics to prove it! Selling tools and techniques have been built and tested. Now I’m looking for a very special individual to become my partner and help dramatically scale the business to be a major player in the billion dollar North American B2B sales training market. If you like the idea of working in a fun, flexible, entrepreneurial environment – if you absolutely love sales & have no call reluctance – if you want to get in at the ground level of a growing business, then this role might be the right one for you. If you know of someone who would be a great fit, pass along their name and if they end up as the partner we’re looking for, we will pass along a $500 referral fee to you. If you’d like to explore this opportunity further, please contact Michael Caron at mcaron@northboundsales.com or 416.456.1440. Why you need to leave a voicemail every time. I’m frequently asked this question and my typical response is, “Why wouldn’t you?” The answers I get back range from “They’ll never call me back so why bother” to “If I leave a message, they’ll know why I’m calling the next time and won’t pick up.” Both are bad answers. Here’s why. “They’ll never call me back.” – WRONG! This just isn’t true. Our own statistics plus statistics from our clients who we’ve trained to leave voicemails all point to the same thing. Some prospects will call you back. While many won’t, some will and some is much better than the “none” who will call you back when you don’t leave a voicemail. 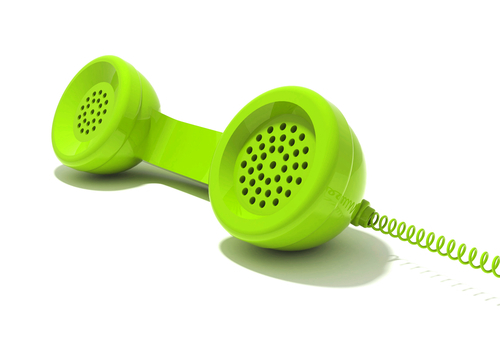 Naturally, the more clear, concise and compelling your message is, the greater the chance of a callback. Our research has shown that callbacks can increase dramatically with the right technique and skill. But there’s an equally powerful reason to leave a voicemail. Even in the cases where it doesn’t lead to a callback, you are able to get your message through to the buyer. You are able to convey the reasons why it makes sense for them to have conversation with you. When you are able to convincingly speak of how you’ve helped others solve problems that they might have, it can cause them to sit up and take notice. Just as in advertising, you’re making a “impression” on the buyer and for people to take action, they often need multiple impressions. “If I leave a message, they’ll know why I’m calling the next time and won’t pick up.” – WRONG! The notion that catching a prospect off guard will somehow help you engage with them seems very flawed to me. Question: Would you be more likely to have a conversation with someone if you a) knew what they were calling about and b) think that they might be able to help you resolve a challenge? Of course you would. And your prospects are no different. When you catch someone completely off guard, their automatic internal knee-jerk response will likely be something like, “It’s a salesperson. I’ve got to get them off the phone.” They will be far less likely to think about what value you might bring to them. If, however, you’ve already touched them with your value proposition several times like you can with your voicemails, there will be a higher likelihood of agreeing to a brief conversation. 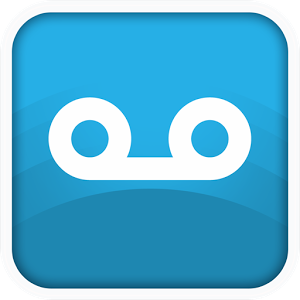 If you haven’t been leaving voicemails when prospecting, start today. As with all your selling skills, you’ll want to practice again, again and again until you sound smooth and natural. You will instantly see both the number of connections increase as well as the quality of your conversations. Northbound’s “Connecting to the Big Cheese” workshop will teach you and your team how to be master this critical selling skill. For pricing or more info, contact Craig Brandys, Vice President of Sales at cbrandys@northboundsales.com. I’ve read several studies over the years about interruptions in the workplace and how they affect our productivity. I, like many sales professionals, enjoyed the fast pace that interruptions created without knowing how much it was hurting my ability to get my key tasks done. All the studies point to the same thing — that the time it takes to handle the interruption isn’t the big time sucker — it’s the time it takes you to get back to the same level of focus and concentration. 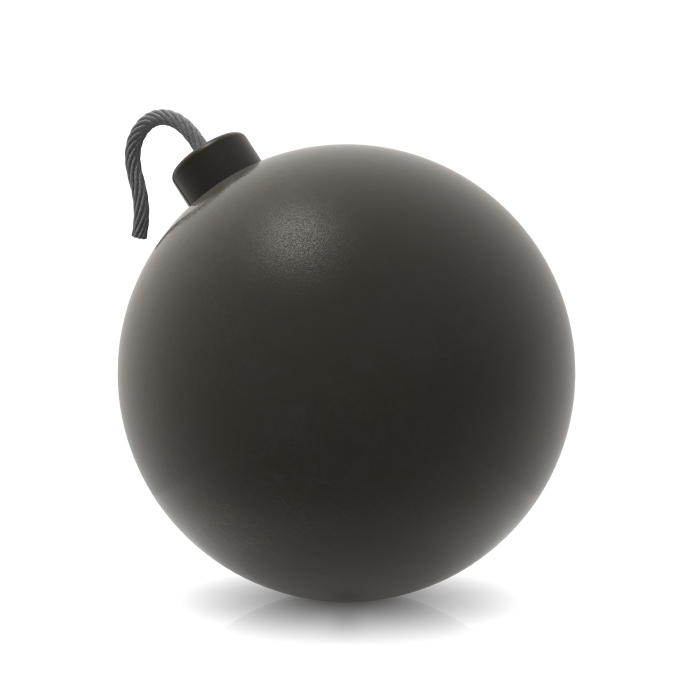 The estimates run from a low of 6 minutes to a high of 23 minutes as noted in a recent Fast Company article. If you are needing to focus on a task, let’s say, making prospecting calls, if you get interrupted even 1 time per hour, you are losing over 12 hours per week or over the course of a year, over 12 weeks of productivity! Crazy but true. Our workshop, “Goal Aligned Time,” provides many strategies to overcome this massive time sucker but a simple one to implement immediately is to do your emails in batches. Stack them up and plow through several at once rather than jumping on each one as it comes in. Stop kidding yourself that “busy” means “productive”. Once you understand the vast difference between these terms, you’ll be able to watch your sales grow! To learn more about our “Goal Aligned Time” workshop or arrange a complimentary one for your sales team (in the Greater Toronto Area), contact me at mcaron@northboundsales.com or 416.456.1440. #2 Reason: They are a kind gesture which makes me feel good! In today’s world of digital communication, we are bombarded with literally hundreds of messages from others on a weekly basis. People just don’t get nearly as much stuff by snail mail any longer and the stuff we DO get it usually junk mail (sounds a lot like our email in box too doesn’t it?). Receiving something in the mail from a real live person is rare. Handwritten notes such as a thank you card is even more rare. A handwritten note helps you stand out. Let me ask you this. The last time you received a hand written card, what did you do with it right after reading it? I bet you didn’t toss it in the trash. I bet you put it on your desk, your fridge, or even showed it to other people. What did you do with the last email “thank you” you got? See the difference? Why do they make me feel good? Taking the time to hand write and drop something in the mail connotes a deeper level of thanks and appreciation. As the famous Canadian futurist Marshal McLuhan famously quipped, “The medium is the message.” Giving thanks to a customer for their time, or for anything in fact, is a big win-win. It makes the receiver feel good but it helps me by building my gratitude. And a recent study published in the Harvard Business Journal confirms what you probably know intuitively – that having gratitude increases happiness and increased happiness leads to higher productivity and sales. What a fantastic ROI on your time! 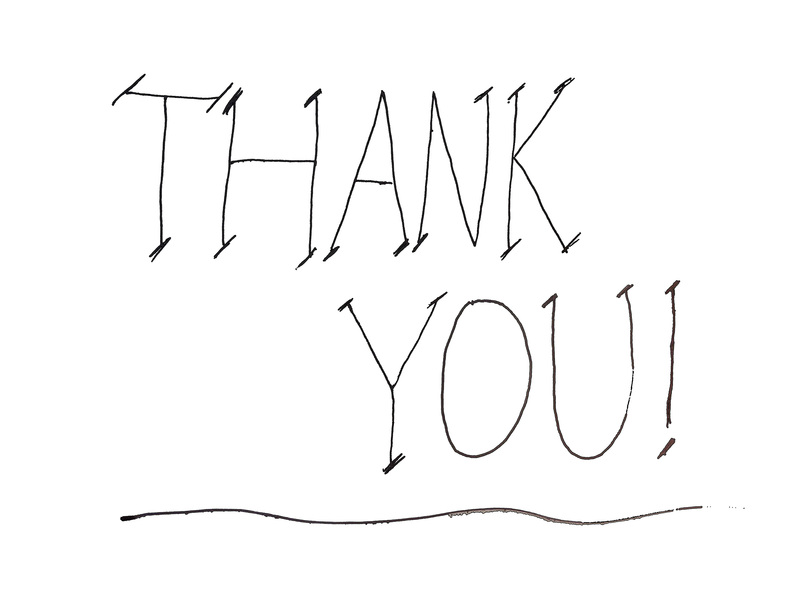 There is one rule with sending handwritten notes including “thank you” cards. They need to be 100% sincere. If you ever try to pass around insincere thanks, it’s the same as passing around counterfeit money. You will eventually be found out and your credibility will be in the toilet from that moment forward. I’d recommend that you order some simple customized cards from any of the online print shops and start each day with a heartfelt thank you. It’ll make someone else’s day and yours too! With most phone calls resulting in voicemail, you need to leave one that will get your prospect to sit up and listen! Voicemail is the norm when making chase calls to prospects. There is an inverse relationship between the size of a company and the ability to connect in person. That is, the bigger the company, the lower the chance of your prospect picking up the phone. The number of contact attempts divided by the number of connections with your prospect is called “contact ratio”. Sales reps that I’ve worked with report contact ratios on the high end of 30% and a mere 2% on the low. With voicemail confronting us so often, how can we increase our chances of being called back? Here are 6 common mistakes that many salespeople make. Mistake #1 – They don’t actually leave a message — I had to get this out of the way because I still run into some salespeople who have been trained (poorly albeit) to “never leave a message”. This makes no sense. Why would you give up the opportunity to get your valuable message into your customer’s ear? I actually prefer to get voicemail on the first attempt. Why? Because it paves the way for my next call. It gives the prospect the purpose of my call and what’s potentially in it for him to have a conversation with me rather than just catching him off guard. Think about it. When you are interrupted from doing something by an incoming sales call, what’s the quickest and easiest way to get back to what you were doing? That’s right — by saying no. Have you ever quickly said “No thanks” to a telemarketer or a door canvaser and then thought later, “Hmm. I might have been interested in looking into that actually.” Even if it may be something you might be interested in buying, the natural knee jerk reaction is to say no. By having your prospect listen to a well crafted voicemail prior to speaking with you, it can prevent the knee jerk reaction. Mistake #2 – They don’t have a Compelling Business Reason (CBR) — There must be a reason and perceived benefit for the listener to take time out of their busy day to have a conversation with you. Too many salespeople position the voicemail around how great they or their company is instead of what might be in it for the prospect to call you. Mistake #3 – They ask for too much — Your first goal in a chase call or voicemail should be to have a two-way conversation. Salespeople shouldn’t ask for a meeting without having first established G.A.S. — that is, value that they may be able to gain for the prospect, future issues they may help them avoid or current problems that they might help them solve. A voicemail should be requesting a very low commitment — a brief conversation to see if there might be a fit between some challenges the prospect has and your company’s capabilities for instance. Mistake #4 – They “wing it” — Some salespeople are against using a phone script. Common reasons are, “It sounds so fake”, “You can’t predict what the prospect is going to say”, or my personal favorite, “I like to mix it up so I sound fresh”. Unfortunately, these same people have little success in booking appointments and after listening to them in the field, it’s easy to see why. Their voicemails are all over the map: convoluted, weak and generally pointless in nature. Yes, some people sound like they are reading when they use a script but only because they haven’t put the time in to practice it until it sounds natural. I do a little bit of amateur acting and on the first read-through of our scripts, it’s terrible. I sound 100% like I’m reading and I am! After rehearsing my lines hundreds of times over, however, it becomes a different story on opening night. A high priced Hollywood actor would never ask to roll the cameras until they know their lines down pat and neither should you. Mistake #5 – They leave too much time in between voicemails — If you call your prospects once every few weeks, it’s easy to become forgotten. On the other hand, if you only leave a couple of days in between your calls to a prospect, you will be forefront and they will feel more compelled to respond. At the end of each voicemail you should say something like, “If I don’t hear back from you by say, end of day tomorrow, I’ll try you again at 10:15 on Thursday.” Your prospects will get the idea very quickly that you’re not going to be giving up anytime soon. Strike a reasonable balance between being persistent and pesky. Mistake #6 – They act too submissive — If you act like a lesser business person begging for the prospect’s consideration, you have reduced yourself and the prospect can lose respect for you. 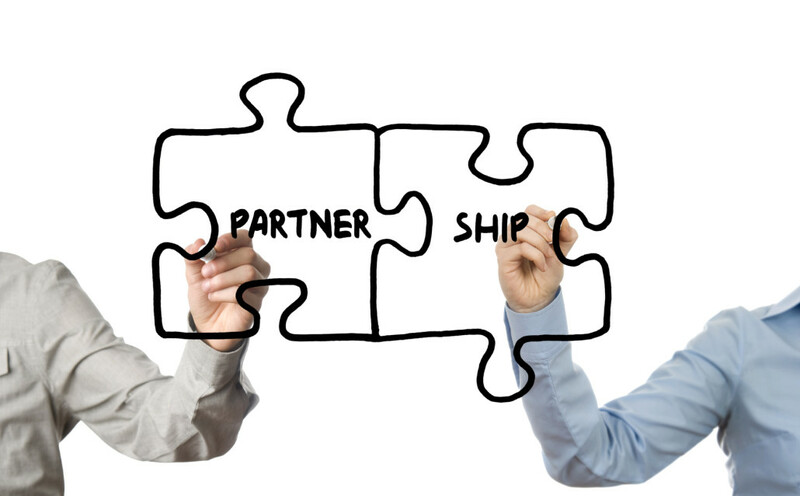 You are one business person requesting to speak to another business person to see if there may be a mutual benefit of working together. Approach the call from an Equal Business Footing (E.B.F.) perspective. Picture how you might speak to another person you meet in a park while walking your dogs together. You wouldn’t be pushy or threatening. That’s how you should think of your prospect when you’re leaving a voicemail. If you sound relaxed, confident, open and honest, your prospect will be much more likely to want to speak with you. It’s one of the most common objections you’ll get … and one of the most difficult to deal with. Objections come in different sizes and shapes which makes objection handling a difficult skill to master. You will get different objections when prospecting than you will when presenting solutions and you need to be able to handle the common ones in a smooth and skillful manner. A tough objection when attempting to set meetings is the dreaded, “We’re happy with our current vendor” which might also come in the form of “We’re good right now” or even “We don’t have any need.” In this article, I’m going to provide you a 3 step process for handling these. Let’s be clear. There may actually NOT be any need. They might actually have a solution in place that is superior to anything else out there. While these situations MAY exist, they are rare. The sad fact is that in many cases, your solution IS better but you never got the chance to find out for sure. Objection handling is often a case of additional communication of the facts. It’s a problem that is often precipitated by poor sales techniques. Why does this happen? In a nutshell it’s caused by the prospect not believing they have any problems with their current solution vendor that warrants attention. Logically, if they knowingly had a problem with their current vendor, they’d probably be calling you instead of you calling them! In a recent workshop, I asked this question: “Who believes that there are potential customers out there who have problems that you can solve but that the customer doesn’t even know they have?” As you might expect, every person in the room threw their hand up. They are 100% right. The overall strategy here is to find some problems. If there is no problem, there is no opportunity. Sometimes I get pushback from people on the use of the word “problem” noting that their product or service provides an “opportunity” for the customer to do better than they are right now rather than there being a “problem” necessarily. While I don’t disagree, we’re really just looking at the same coin from a different side. Northbound’s sales development program is named “Goal Aligned Selling™” because our entire methodology revolves around helping the customer achieve their goals. 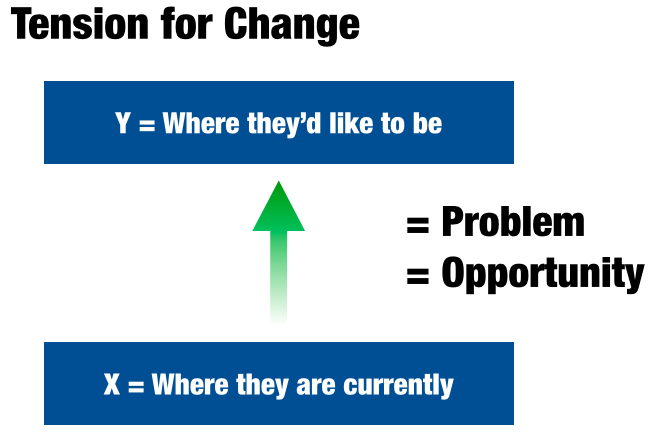 When a customer perceives a gap between where they are and where they’d like to be, “tension for change” is created. Only when this tension for change exists, will the customer be motivated to explore a possible change to the status quo. The diagram above illustrates the concept. Naturally, a very direct way of course is to just ask the buyer what problems they have. You could come right out and say something to the effect of this. Customer: I really don’t have any. Thanks for your call. 1. Establish what the customer is trying to accomplish in the key result areas. 2. Probe for areas where there might not be 100% satisfaction. 3. Help them see that they might be able to do better in the key result areas than they are right now. Executing this strategy can be quite challenging and requires more detail than I have for this post. I will follow this up shortly with some specific ways of implementing this strategy with your prospect. Using a well practiced script for prospecting is a key to success. Reason #1: The words will be more powerful. You’ve only got a few seconds to get the listener to want to keep talking. In fact, one study found that a listener will start deciding whether they want to continue a phone conversation or not in the first 8 seconds! Having a script allows you to craft the message in a clear, concise & compelling manner. In my experience, salespeople who try to “wing-it” end up in convoluted, weak conversations that end in failure. Rather, when you put the time in, you can craft a message that gets to the point – a point that will resonate with your prospect. Reason #2: You can perfect your delivery. Just like a professional performer, your delivery will get better and better when you know what you’re going to say and you practice it until it’s smooth. Can you imagine a performer who tries to do things differently every night? Most people’s experience with salespeople who are obviously using a script is usually negative. Why? Because they usually are hired, given a script and told to simply read it to the customer. Of course it sounds fake because they are reading it and haven’t practised it until it’s great. The irony is that the more practiced you are, the more natural you sound! You will never know that someone who is good is using a script because it sounds so natural. Reason #3: You will have more confidence. Prospecting can be nerve-wracking but when you know how you’re going to approach a prospect and have it well practiced, you’re confidence will multiply. And your increased confidence will benefit you in two ways: The confidence will come through in your voice and you’ll be less fearful of making more calls! With the recent anti-spam legislation in Canada, there is going to be a much greater emphasis on phone prospecting. Are you prepared? Northbound’s workshop, “Connecting to the Big Cheese” covers all the critical parts of prospecting skills including script development. For more info, click here or contact me at mcaron@northboundsales.com or 416.456.1440.